10. That Was the Best Near-Death Experience Ever! Bronze Age of the Nineties is Liance’s intriguing second release that is quite unapologetically a work of self-expression. If you’re looking for something catchy to dance to or power ballads to belt your heart out with, you may be disappointed. But if you seek an intimate story with a host of characters starting with the eponymous "Meg" and ending with Johnson, Steve, and more in "That Was The Best Near-Death Experience Ever!" you may find yourself pleasantly invested in the individuals that surround Liance, who comment on and reveal his coming of age. In short, this album is best described as a diary set to music and is worth a listen as such. 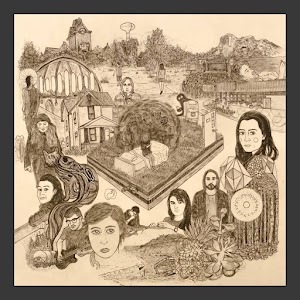 Its sound is somewhere in between Sufjan Stevens and Blur, a "dirty" folk genre with alternative rock influences if you must, with plenty of ethereal tones, generous use of reverb, and moody acoustics that unassumingly blend with carefully placed distortions and electronic elements. The delicate use of wind instruments in "Sheets" further wraps the album into a very comforting balance that sounds like something you’d play on a snug rainy day on a road trip. Despite having compelling sounds and stories, Liance sometimes struggles to put the two together has he sacrifices melody in order to fit lyrical phrases into a chord progression. "I Watched The News Today, ISIS Burned A Man To Death In A Cage" sounds more like a recitativo where he sings a lot of words and forces the ending phrases to rhyme. On the other hand, "Pine Rest" is more successful as it delivers hallowing harmonic melodies with well-spaced lyrics that could easily be a track on a more renowned artist’s album. That’s the other thing – Liance’s vocals are its "weakest" aspect and at times, I thought a more mature vocalist may do the musical ideas greater justice. Some songs sound a bit ambitious, out of range, or just unsuited for Liance’s voice, but the imperfections also add emotion and character to these very autobiographical songs so I can’t really decide whether they improve the album or not. Give it a listen and decide for yourself. Overall, Liance does a decent job of transporting you into the ambient spacetime of young adulthood. It’s sometimes overbearing with narrative content, which is a rare problem for music nowadays, but it’s set to a host of warm sounds and ideas that have been intimately curated to complement a fine lyrical memoir. The whole album could easily be heard as one song, with "Oyster Boys" being a dramatic Britpop-esque grungy intermission, before resuming the temperamental acoustics. Liance has matured in musical style and ideas compared to his previous album "Visions of Victoria", but execution remains young; tune in for the story and concepts and don’t expect a polished masterpiece.